A contact’s original source type gives you insight into how a contact first interacted with your website. They could have first come into contact with you through paid search or social, organic search, direct traffic, and a number of other sources. One of these “other” sources is offline sources. One of the most common reasons why a contact would get tagged as originating from offline sources is if they were imported into HubSpot. 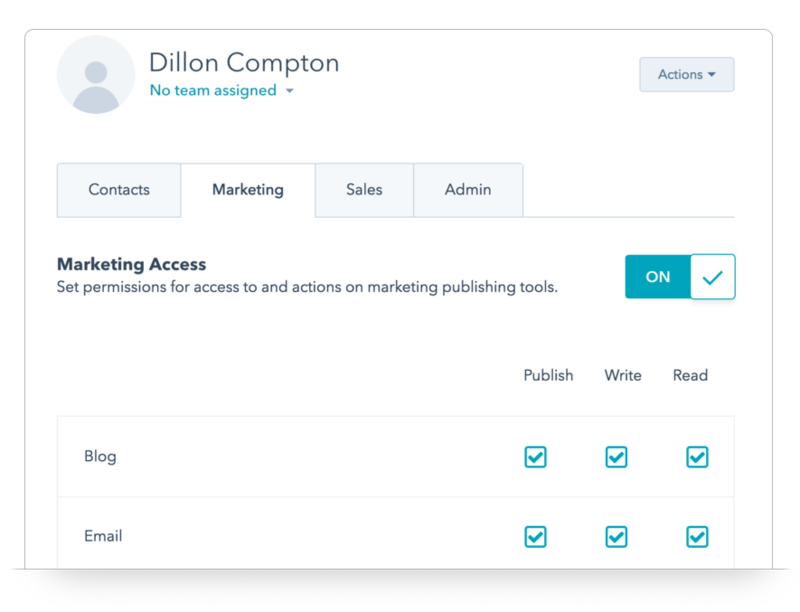 Marketing, Sales, or Service Hub Enterprise users can now sign into HubSpot with a SAML 2.0 single sign-on identity provider, such as Okta or OneLogin. Recently, we released a beta of bi-directional account sync with HubSpot companies and Salesforce accounts. This feature is now available to all integrated portals. 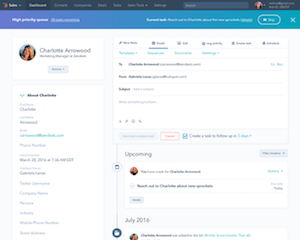 HubSpot will now create accounts in Salesforce and manage re-associations. All Service Hub Professional users can now create custom tickets reports. They can also customize their tickets reports on their service dashboard, as well as the ticket reports in the report library. No one likes manual data entry - so it’s important that your import process runs as smoothly and efficiently as possible. The new HubSpot import UI does just that. Now live are some early changes on our way to greatly enhancing the HubSpot import tool. This post breaks down the changes and why we’ve made them. Contacts that originated from offline sources are now eligible for lead revisit notifications. All users of the Salesforce integration with HubSpot now have a visually refreshed Sync Errors page to help manage and resolve outstanding errors. 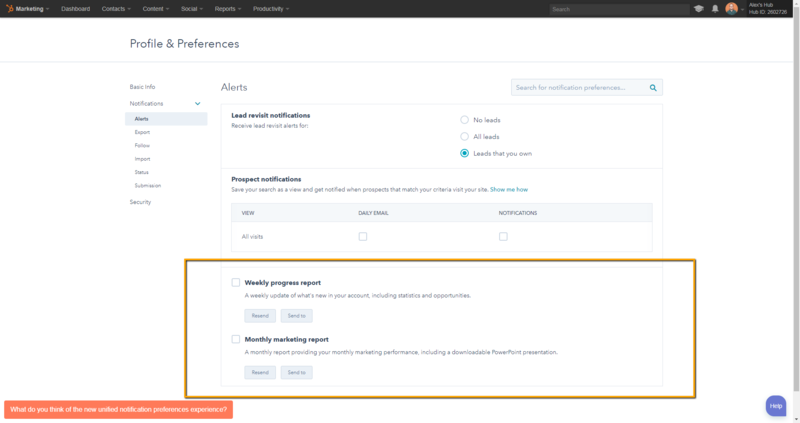 You can now set a default dashboard in HubSpot so you are brought to the most relevant screen when clicking the sprocket logo in the new navigation. All reporting add-on users will also be able to manage their dashboards from the new dashboard manager. UPDATE: 8/6 - The new package is now available for all Salesforce integrated portals. For answers to a number of frequently asked questions, feel free to refer to this knowledge doc. Starting today, you will have a banner notification on the Salesforce settings screen that will allow you to upgrade your package. This will require an update to the package in Salesforce. We strongly recommend that you update your package as soon as possible. If you do not update on August 6th, data will still sync between both systems. The only data that will no longer be syncing is the HubSpot Intelligence object. We’re changing the name of the HubSpot Owner property to reflect the type of record the user actually owns. For example, HubSpot Owner on your HubSpot contacts will become “Contact Owner,” “HubSpot Owner” on companies will become “Company Owner,” and so on. 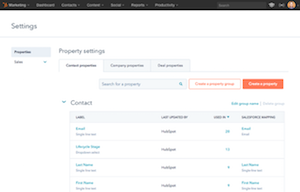 HubSpot’s native forms tool is now available in HubSpot CRM Free. The Deal Forecast Widget has been updated to give sales people a more complete picture of their current deals, and gives managers easier access to controlling their team quotas. The ability to manage Salesforce Suspension Notification Emails from within the Notifications Center. 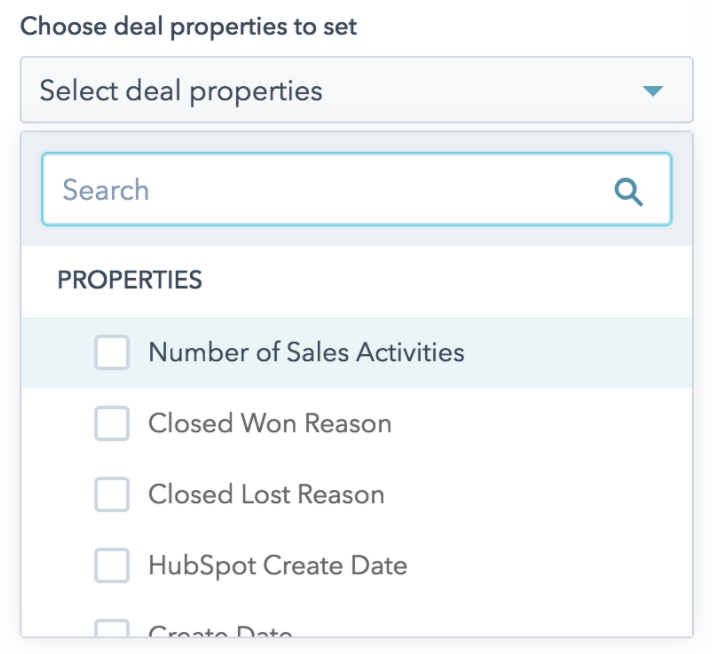 The ability to set or copy additional deal properties when creating a deal through Workflows. As businesses grow, so does the need for customization and flexibility. Now you can work more productively with the latest updates to meetings -- all of which bring added customization and flexibility to your day. Not all sales activities are created equal. Seeing that you’ve made 300 calls in a month, or had 100 meetings, is great --- but it doesn’t tell the whole story. Were they all introductory calls? Demos? Closing calls? Meetings to negotiate pricing and discounts? Optimizing your process is all about getting specific with where your team is spending its time. 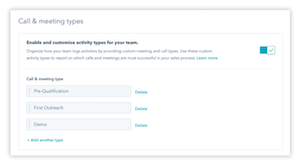 With today’s update, create custom types for your calls and meetings, set a type for each activity as you log it, and report on your activity types over time. How many email addresses do you have? If you’re like us, chances are you have more than one. A work email. A personal email. An email address from each of the companies you contract for, or for each of your clients. An email alias (e.g. kristin@acme.com, in addition to ksmith@acme.com). If you have multiple email addresses, it shouldn’t come as a surprise that your customers do too. With today’s update, you can store additional email addresses in the Email property on your HubSpot contacts. You've likely heard the expression before that "practice makes perfect", or even read Malcom Gladwell's theory on "10,000 hours" that practice is an important component of learning, and ultimately mastery. 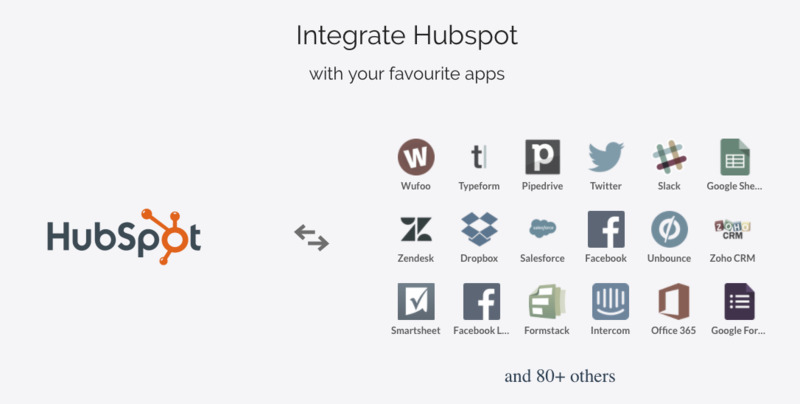 Automate.io is software that helps connect and automate actions between apps and CRMs like HubSpot. They offer simple workflows that perform common tasks associated with sharing data and automating tasks. At HubSpot we aim to help bridge the gap between learning, and doing. 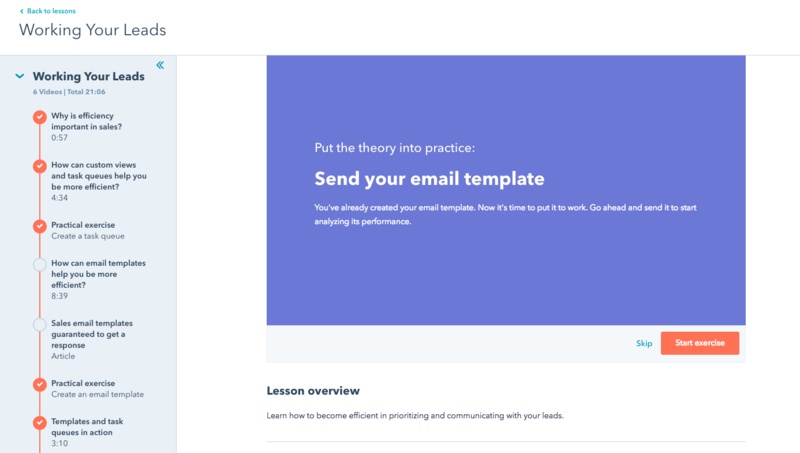 That’s why we’ve recently added practical exercises into our certification content to help our community put the theory into practice. These exercises are placed after educational content that describes the why and how of a topic, and they introduce the what in a few easy steps. Sales is all about efficiency. The more time you spend switching between systems, the less time you have to build helpful relationships with your prospects and customers. Previously in HubSpot, email replies were logged in your CRM. But if you wanted to actually respond to those replies --- let’s face it, how many email chains are only two emails long? --- you were forced to leave your CRM, open up your inbox, track down that email, open it, type your reply, log your reply from there, and then return to your CRM to continue your day. Too many steps. 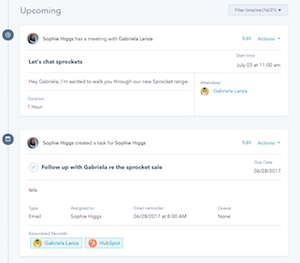 With today’s change, you can reply to those emails without leaving your CRM --- right from the comfort of your contact, company, and deal timelines. It’s the most exciting time of the year at HubSpot. In September, we wrapped up our biggest INBOUND event yet --- more than twenty-one thousand people joined us in sunny Boston for a week of inspiration, education, and transformation. Michelle Obama, Brene Brown, John Cena, and dozens more graced the INBOUND stage. As in years past, INBOUND marks peak product launch season at HubSpot. With that in mind, there’s a slew of new functionality in your HubSpot portal. In the video below, we'll run you through all of it, in less time than it takes to get a cup of coffee. 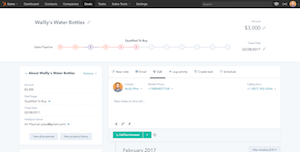 Timelines in HubSpot are where you track every interaction an individual (or company/deal) has with your business. That’s right: every interaction. Page views, sales emails, list memberships, and over a dozen other things. That amount of info is incredibly powerful. But, in truth, it can make the timeline incredibly overwhelming as well. For contacts with a ton of interactions, sorting through the timeline to find individual engagements is like trying to track down one specific kid at DisneyWorld. There’s plenty of awesome stuff, but it’s nearly impossible to find the thing you’re actually looking for. With that in mind, in the last few months, we’ve made several changes aimed at making it easier to find what you’re looking for in HubSpot records. First, it was a rollup of all the pageviews in a specific session. Then, it was a new section for upcoming engagements, cordoned off from the rest of the timeline. Today, we’ve got three more for you. 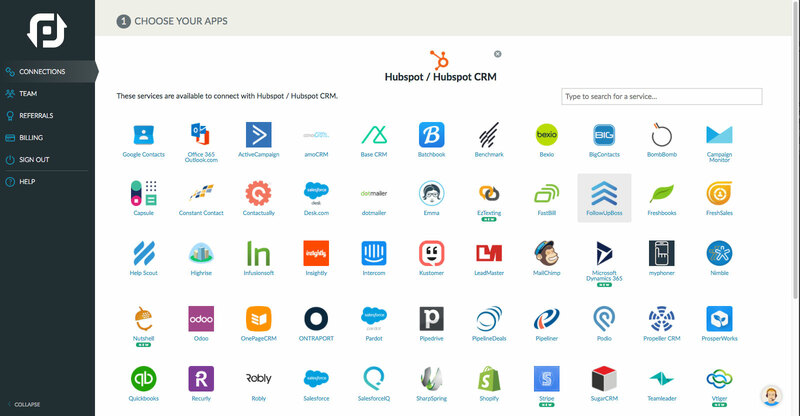 Starting today we're bringing HubSpot Marketing Free, to our Free CRM users who don't already have the tools. Since March, 2017 Marketing Free has just been a part of the Free CRM but users who signed up before then have not been provisioned for the tools. 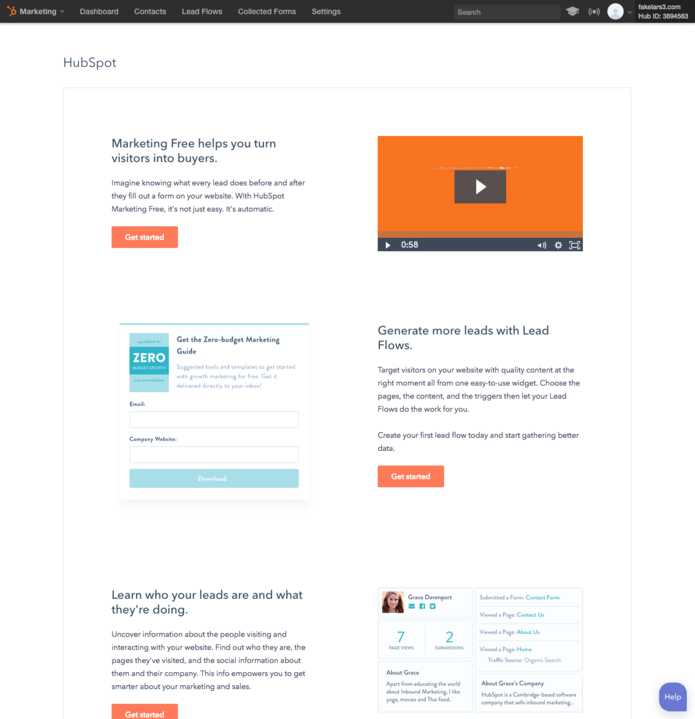 Those users don’t see “Marketing” in the switcher in the upper left hand corner of HubSpot. 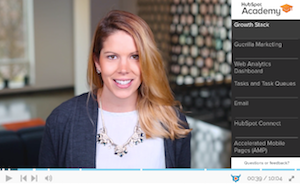 This update adds Marketing to HubSpot CRM for those users. One of the best ways to keep your team u p to speed on the progress of your inbound performance is by se tting up recurring emails of your HubSpot dashboards to all the key stakeholders in your company . In the last few weeks, the process for setting up and sending those emails in HubSpot has gotten more secure and streamlined. 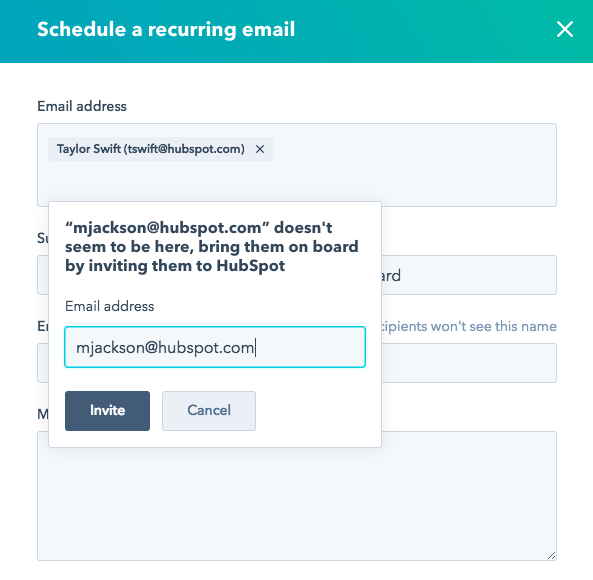 Recently, the “ Schedule a recurring email” feature was updated to allow dashboards to be sent only to users of your HubSpot portal. Starting on September 20 , 2017, any previously configured recurring dashboard emails scheduled to be sent to non-users of your portal will no longer be sent. 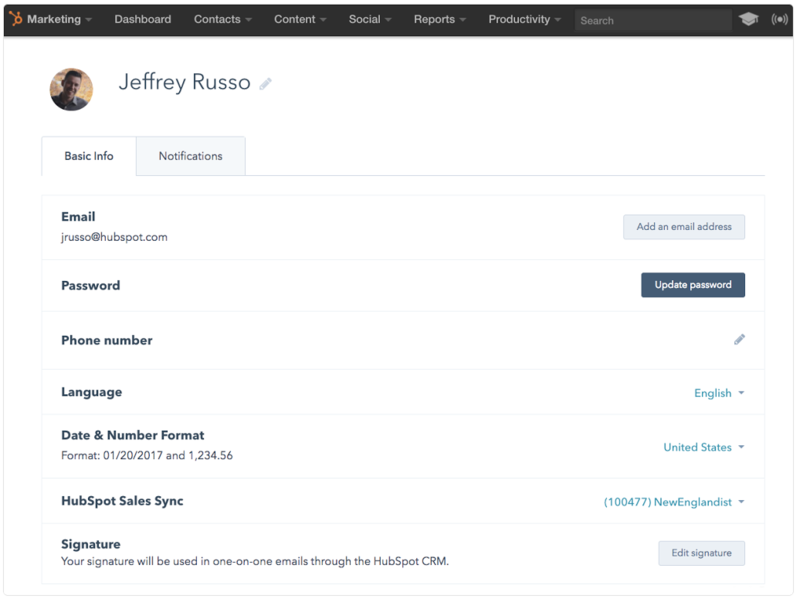 Views in HubSpot CRM are your best way to get a quick glance at a set of contacts, companies, or deals. They help you organize and prioritize your process. 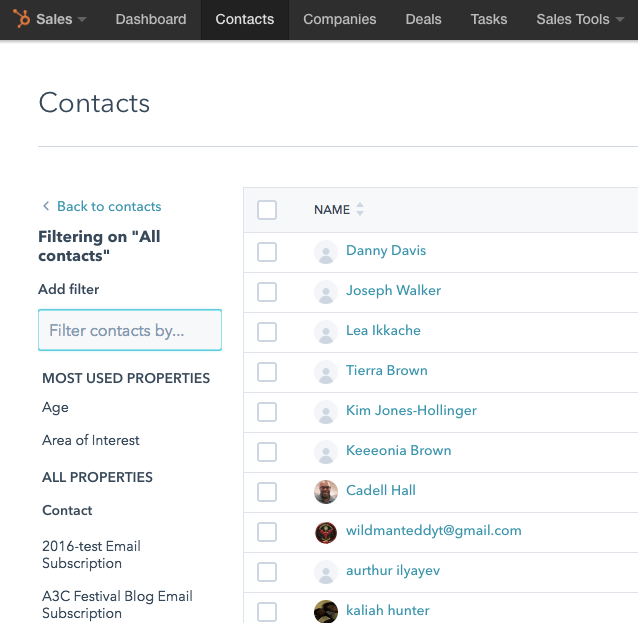 Views in HubSpot CRM are now called saved filters. Saved filters are now accessed via a full-screen management area, rather than a small sidebar dropdown. You can now favorite up to five saved filters, which will remain pinned to the left-hand sidebar. Creating a saved filter is now much more spacious. In addition, the five properties you use the most are now surfaced front-and-center when creating a saved filter. Saved filters can now be shared with a single team. Previously, they could only be private or shared with all. And finally, for the first time, saved filters are available in HubSpot Marketing, in addition to HubSpot CRM. In sales, you need to see the most important things front and center. The more you have to search and scroll to find what you’re looking for, the less you’ll sell. Plain and simple. With that in mind, over the past year, you’ve seen several updates aimed at making your CRM’s display more flexible, so that you spend less time searching: the ability to drag, drop, and reorder, and minimize cards on records, a clearer view of web interactions on the timeline, and more. 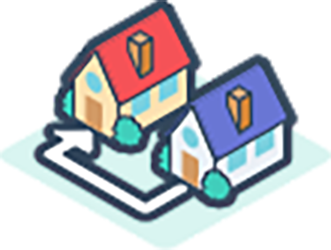 With today’s update, you can sort your deal board by any property you choose. 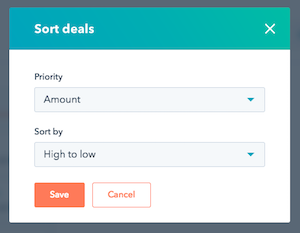 Sort by amount to put your most valuable deals front and center, by owner to check in on your reps’ deals one-by-one, or whatever’s most important to your team. We’ve rebuilt the tools you use to manage users inside HubSpot from the ground up. You’ll find a number of awesome improvements (explained below), and a clean new design. This enhancement to the the Timeline API allows integrators to extend their software into HubSpot via a modal window. 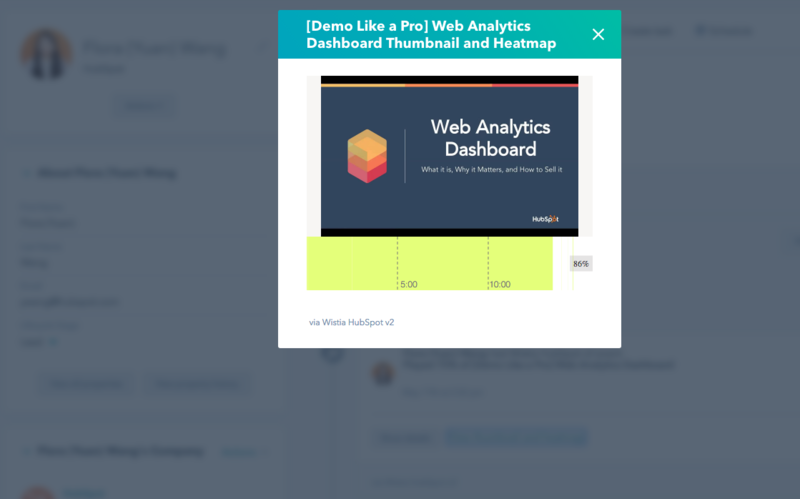 When included, the integration will create a new event in HubSpot Marketing or CRM with a link, that when clicked will open a modal window (IFrame) into the partner’s software. New Fields: When you create a task through Workflows, you can now set the Type, Title, and Reminder Date fields automatically. Task Personalization: In addition, you can also add contact personalization tokens to both the Task Title and Notes. Click here to try it out in your portal. 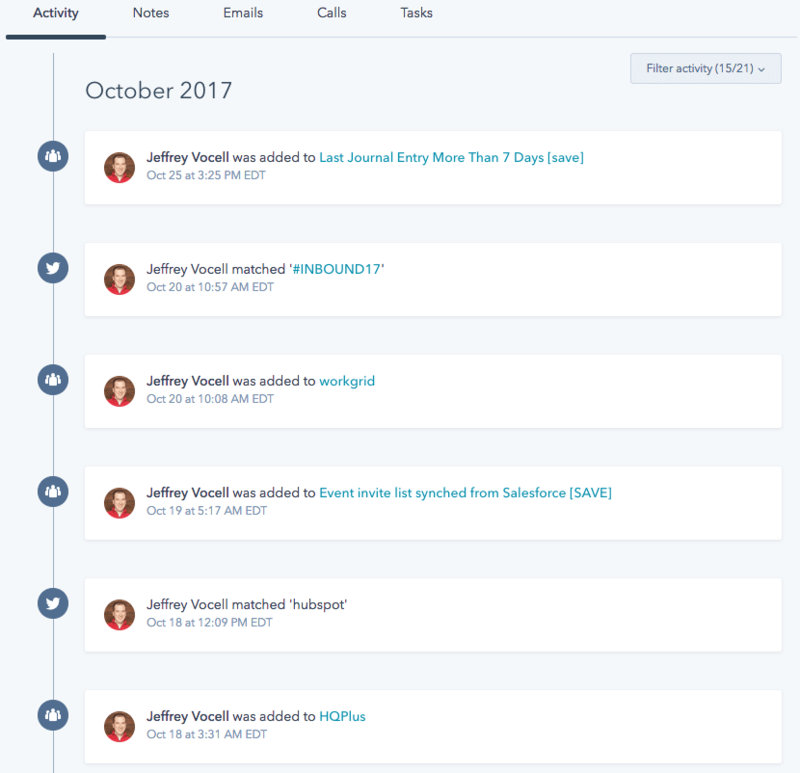 The contact timeline in HubSpot CRM is where you track every interaction an individual has with your business. That’s right: every interaction. Page views, sales emails, list memberships, and over a dozen other things. That amount of info is incredibly powerful. Reporting is the compass that keeps your inbound efforts headed in the right direction. The more deeply you can understand what’s worked in the past, the better you can optimize your future strategy for both your business's growth and your buyers' experience. 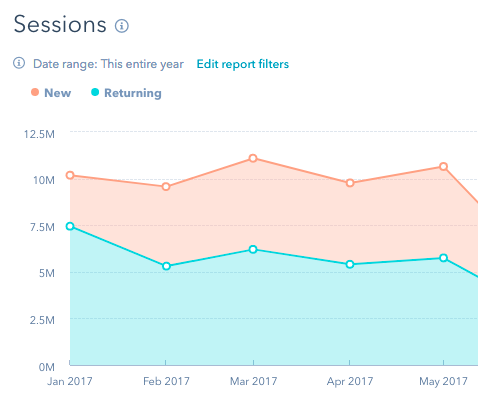 In the last few months, you got access to four new social media reports and five new contacts reports, to help you measure even more of your inbound results. Today, we’re taking that a step further. Moving forward, you’ll have access to an entire library of dozens of out-of-the-box reports that can be added to any of your HubSpot dashboards with one click. No extra fees, no extra clicks, and a whole lot fewer Vlookups to run in Excel. 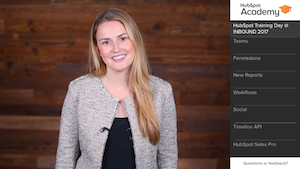 Just in the nick of time, here are this month's biggest HubSpot product updates in a neat and tidy six-minute video. Your reporting needs aren't one-size-fits-all, and your dashboards shouldn't be either. You no longer need to set dashboard-level filters. 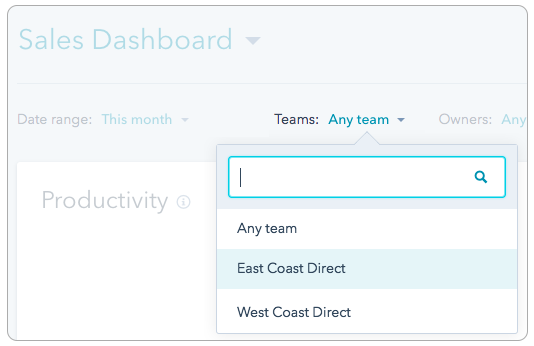 With this update, you can now include individual reports with different date ranges, owner or pipeline filters, all in the same dashboard. If you use the reporting add-on, you can now filter your custom dashboards by owner and pipeline. Previously, those filters were only available on the default marketing and sales dashboards. Marketing starts with individual: no matter the nature of your company, you’re trying to convert real people into loyal customers and evangelists of your brand. That’s why your HubSpot Marketing tool is centered around an robust, integrated contact platform. But if you’re B2B, your organization lives and breathes in the world of the companies those individuals work for. The data you collect about the companies you interact with — size, industry, location, and more — is just as important to your marketing efforts as any trait of the individual contacts. With that in mind, did you know that your HubSpot Marketing portal comes fully equipped with a company database? 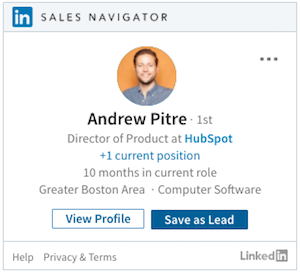 With today’s change, that companies database now lives under “Contacts” in the HubSpot Marketing navigation. You need fast, reliable, and trustworthy marketing data, so you can show the value of your marketing efforts and make better business decisions. With that in mind, over the last few months, we've completely rebuilt the back-end HubSpot analytics engine with the goal of providing you with even more robust and precise metrics. 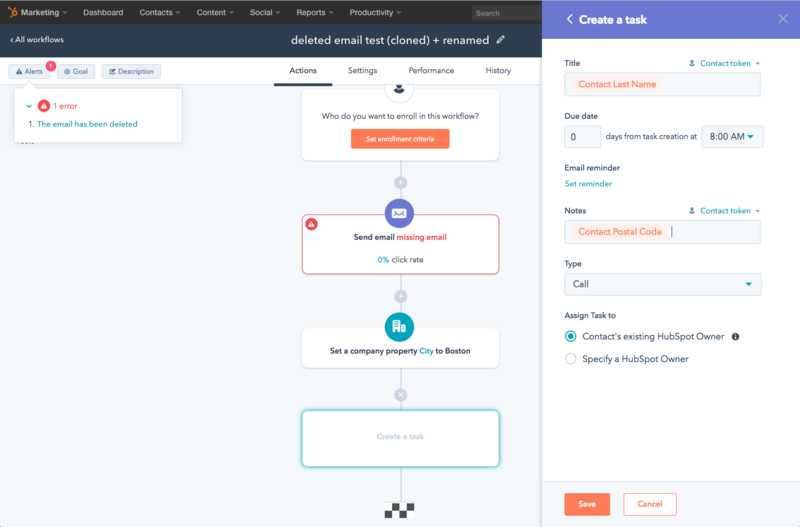 When we first built the call queue in HubSpot CRM, the goal was simple: create a tool that helped sales reps work more efficiently and in a more focused way. Over time, you've given us great feedback on the tool, and reviews have been mixed on how well it lives up to that goal. It helps a sales team call leads faster, sure. But it lacks the flexibility to truly make a sales team more productive. Calling quicker is great, but what about emails and other to-dos? What if you want to set up multiple queues for different types of follow-up? What if you’re following up on a specific deal --- how does the call queue help you to track that down? With that feedback as our north star, we launched a brand new productivity tool in HubSpot CRM called task queues. If you haven’t checked out task queues, here’s the gist: think of a task queue like a playlist for your tasks. Simply create a task queue for a certain category of to-dos - it could be based on time zone, territory, priority, or anything else you choose. Add tasks to the queue. Press play. Run through your tasks. That’s it. In short, task queues is the future of getting things done in HubSpot CRM. With that in mind, on July 10th, the call queue feature will be removed from the CRM. 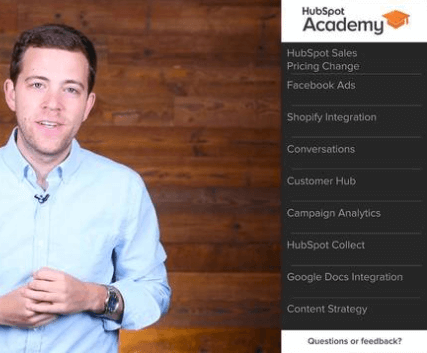 It's that time once again --- three exciting updates to the HubSpot product, in under five minutes. Give it a watch, and let us know what you think in the comments below. If you’re a sales manager, you know how critical speed is to your team’s success. When your reps are creating CRM records, the quicker, the better. The more time they spend entering data, the less time they spend selling. But there’s a caveat: while speed is crucial, if your reps enter the wrong data --- or not enough data --- you end up with a spotty database and an inconsistent process. Sales doesn’t always happen from behind a desk. If you’re a field rep --- or even if you’re not --- parts of your process take you on the road. Whether a dinner with a prospect, an in-person demo with a lead, a trade show, or even a busy morning commute, your sales process needs to travel with you. 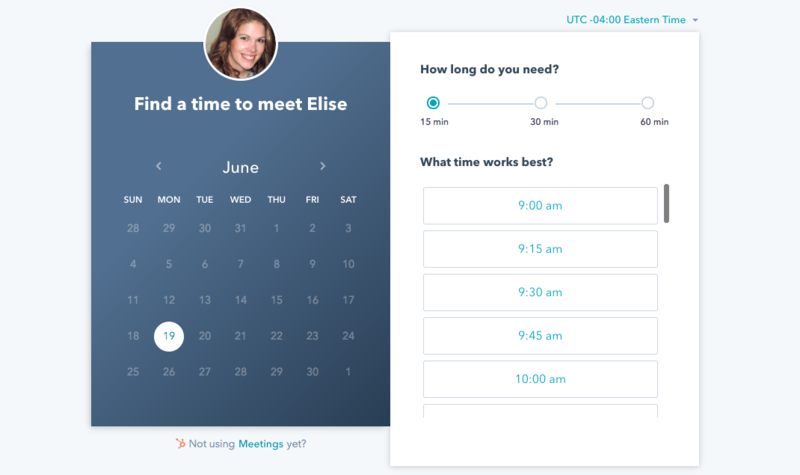 PieSync is software that syncs contacts between cloud apps. Once integrations are hooked up the tool works in the background to sync contacts in real time. This gives users consistency of data across tools. Connect PieSync to HubSpot here. Integrations include HubSpot (CRM/Marketing), Mailchimp, Google Contacts, Salesforce Desk, Zendesk, Marketo, Campaign Monitor, and many more. See All. 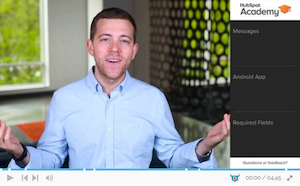 The best ten minutes of your month are back again: a brand new (April Fool's) edition of the HubSpot product spotlight video is below. 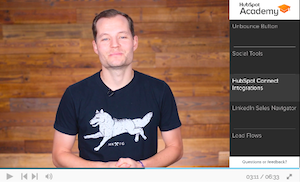 Use the chapters on the right-hand-side of the video to find the new features most relevant to your routine, and leave us your feedback using the feedback link. We've refreshed the User Profile & Preferences screen in HubSpot to lay the groundwork for future improvements, and give you a cleaner experience when editing settings. You'll also notice that we've made it easier to find under the main Settings dropdown in your HubSpot navigation. If you use HubSpot CRM, you’ll agree: tasks in the tool have been adequate, not exceptional. They’re like eating iceberg lettuce. Not the end of the world, but not mind-blowingly awesome either. Today, that changes. Task management in HubSpot has a brand new look, and a slew of new functionality to boot. Staying on top of to-dos is pivotal to your sales team’s success. Every missed follow-up is a lost chance at a connection with your prospects and customers. 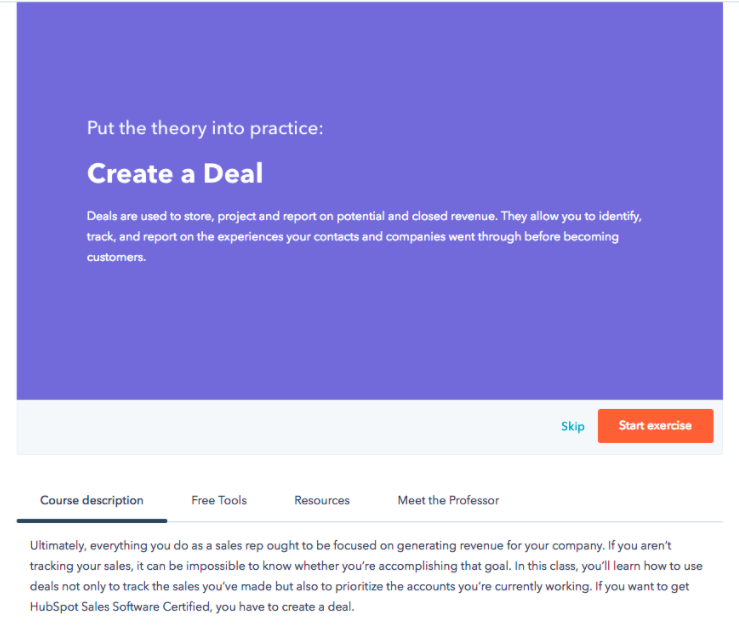 With HubSpot’s new tasks interface, you’ll never let a task slip through the cracks. If you’re a sales rep, you spend your day making calls, sending emails, and booking meetings. The more efficient you can be at those three things, the better you’ll be at your job. With today's change, reaching out to your contacts even easier: you can now make calls from company and deal records, in addition to contact records. Fewer clicks in the CRM means time saved means more sales. It’s that simple.